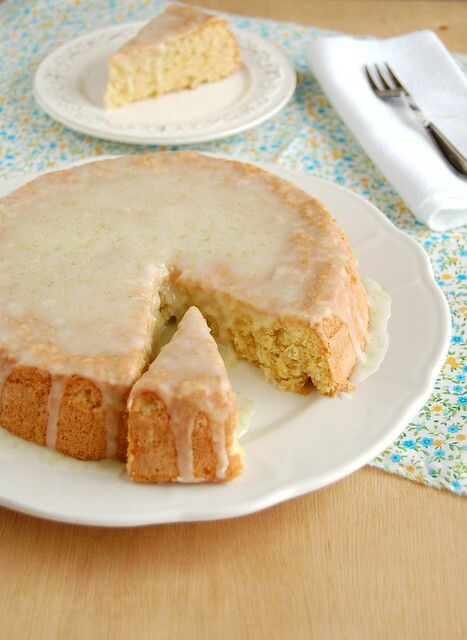 I bought a bag of limes especially to make this cake – the idea of mixing them with coconut and macadamias sounded really good. Like many Saturdays, I removed the butter from the fridge very early in the morning so it would become soft for my baking section. Then, reading the recipe and placing all the ingredients on the sink I stopped, read it again and then again – there’s no butter in the cake. There’s no oil either. Ok, so the fat will come from the nuts, fine. Stop worrying and carry on, Patricia. I placed the cake in the oven and started thinking: will it be dry? I hate dry cakes. Well, it was too late for that – all I could do was wait for it to be ready. Preheat the oven to 180°C/350°F. Butter a 20cm (8in) round cake pan, line the bottom with baking paper and butter the paper as well. Place the macadamias, flour and baking powder in a food processor and process until the nuts are ground. In the bowl of an electric mixer beat the egg yolks, sugar and vanilla until pale and creamy. Fold through the lime zest and coconut, then the nut mixture. Place the egg whites in a clean, dry bowl, add the salt and whisk until stiff peaks form. Fold lightly through the nut batter. Transfer the batter to the prepared pan. Bake for 30-35 minutes or until risen, golden and pulls away from the sides of the pan – a skewer inserted in the center of the cake should come out clean. Remove from the oven and cool in the pan, over a wire rack, for 15-20 minutes. Carefully unmold onto a rack, remove the baking paper, invert onto another and let cool completely. Make the icing: combine the icing sugar, lime juice and zest in a small bowl and mix until spreadable (add more juice if needed). Add more juice if necessary. Drizzle over the cooled cake to serve. This sounds a really interesting cake. I'm intrigued by the fact that it has no added fat, as I'm always looking for baking recipes with low-saturated fat levels. What?!! No butter? No oil?! (I'm doing the same double take you must have done). I MUST TRY THIS RECIPE!!! Yum! This cake sounds scrumptious. I love citrus, especially in cakes. The macadamia nuts sounds like a great addition too. ok, the most delicious a cake can get without butter or oil! So delicious I made it twice over the weekend! Passionfruit icing is also yummy. Hey, anonymous, that is great news, tks for letting me know how the recipe turned out!